Between 1886 and 1924, almost 14 million immigrants entered the United States through New York. The Statue of Liberty was a reassuring sign that they had arrived in the land of their dreams. To these anxious newcomers, the Statue’s uplifted torch did not suggest “enlightenment,” as her creators intended, but rather, “welcome.” Over time, Liberty emerged as the “Mother of Exiles,” a symbol of hope to generations of immigrants. 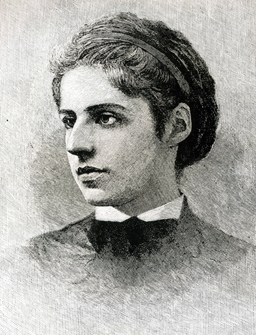 A portrait of Emma Lazarus. The opening of the immigrant processing station at Ellis Island in 1892 in the shadow of the Statue of Liberty facilitated an immigrant association, as did the later popularity of Emma Lazarus’s poem, “The New Colossus.” In 1883, Lazarus donated her poem, “The New Colossus,” to an auction raising funds for the construction of the Statue’s pedestal. This poem vividly depicted the Statue of Liberty as offering refuge to new immigrants from the miseries of Europe. The poem received little attention at the time, but in 1903 was engraved on a bronze plaque and affixed to the base of the Statue. “On the humanitarian front, our nations agreed that we have to do even more, individually and collectively, to address the agony of the Syrian people. The United States is already the largest donor of humanitarian aid to the Syrian people — some $4.5 billion in aid so far. As winter approaches, we’re donating additional supplies, including clothing and generators, through the United Nations. But the U.N. appeal for Syria still has less than half the funds needed. Today, I’m again calling on more nations to contribute the resources that this crisis demands. In terms of refugees, it’s clear that countries like Turkey, Lebanon and Jordan — which are already bearing an extraordinary burden — cannot be expected to do so alone. At the same time, all of our countries have to ensure our security. And as President, my first priority is the safety of the American people. And that’s why, even as we accept more refugees — including Syrians — we do so only after subjecting them to rigorous screening and security checks. “In Europe, I think people like Chancellor Merkel have taken a very courageous stance in saying it is our moral obligation, as fellow human beings, to help people who are in such vulnerable situations. And I know that it is putting enormous strains on the resources of the people of Europe. Nobody has been carrying a bigger burden than the people here in Turkey, with 2.5 million refugees, and the people of Jordan and Lebanon, who are also admitting refugees. The fact that they’ve kept their borders open to these refugees is a signal of their belief in a common humanity. And so we have to, each of us, do our part. And the United States has to step up and do its part. And when I hear folks say that, well, maybe we should just admit the Christians but not the Muslims; when I hear political leaders suggesting that there would be a religious test for which a person who’s fleeing from a war-torn country is admitted, when some of those folks themselves come from families who benefitted from protection when they were fleeing political persecution — that’s shameful. That’s not American. That’s not who we are. We don’t have religious tests to our compassion. And so I think it is very important for us right now — particularly those who are in leadership, particularly those who have a platform and can be heard — not to fall into that trap, not to feed that dark impulse inside of us. I had a lot of disagreements with George W. Bush on policy, but I was very proud after 9/11 when he was adamant and clear about the fact that this is not a war on Islam. And the notion that some of those who have taken on leadership in his party would ignore all of that, that’s not who we are. On this, they should follow his example. It was the right one. It was the right impulse. It’s our better impulse. And whether you are European or American, the values that we are defending — the values that we’re fighting against ISIL for are precisely that we don’t discriminate against people because of their faith. We don’t kill people because they’re different than us. That’s what separates us from them. And we don’t feed that kind of notion that somehow Christians and Muslims are at war. Evangelical Christians, as well as Christians more broadly, are a core group in the Republican electoral base and are among the most passionate advocates for aiding refugees. Faith-based groups, who play a key role in resettling refugees to the United States, say they are dismayed by the wave of anti-refugee fervor set off by the Paris terrorist attacks and are urging supporters to contact elected officials on behalf of victims of the Syrian civil war. Syrian refugees next year. More than half of U.S. governors have said they do not want Syrian refugees resettled in their states, while House Speaker Paul Ryan says he wants a vote this week on GOP-drafted legislation to halt the administration’s plans. World Relief is one of nine groups, several of them faith-based, that help the U.S. resettle up to 70,000 refugees from around the world in the United States each year. Others include the U.S. Conference of Catholic Bishops, Lutheran Immigration and Refugee Service, and the Church World Service. Many other faith-based groups, including evangelical Christian organizations, also perform aid work overseas specifically aimed at refugees fleeing conflicts. They’re often more stable than the average renter. One week a refugee family is fleeing the brutality of civil war and living in a shipping container near the Syrian border, and the next they might be moving into a furnished apartment in Cleveland. Completing this trek from war-torn villages to safety in the U.S. can take years and involves a complex apparatus of donors, volunteers, nonprofit organizations, and U.S. State Department personnel. But the resettlement process ends just like every American apartment rental story: with a signature on a lease. Welcoming refugees to the U.S. has become a highly charged political issue in the wake of last week’s terror attacks in Paris that killed 129 people. The House voted on Thursday to put the resettlement program on hold even in the face of a growing humanitarian crisis. Thirty-one governors have objected to taking in refugees, and a majority of American adults in a recent Bloomberg Politics poll doesn’t want to accept Syrians over concerns about terrorist infiltrators. There is renewed impulse to protect the nation by turning away desperate refugee families trying to escape dangerous areas. But the small group of U.S. property owners who lease homes to refugees have come to learn something that has been noticed in this heated debate: Renters from regions suffering the gravest instability tend to make the most stable tenants. Renting to refugees, it turns out, has become a surprisingly steady business. For the last five years, Daryl Anderson has been buying foreclosed homes in Cleveland on the west side of the Cuyahoga River, usually for less than $8,000. He fixes them up and rents most of the homes to new arrivals from Iraq, Somalia, and the Democratic Republic of the Congo, among other places mired in conflict. About 80 percent of the tenants in his 40 rental units are refugees.